Ego wars at workplaces, especially between Boomers (Gen X also falls under this broad category) and Millennials (Gen Y), are nothing new. But in a fast-paced world where skills get obsolete in a blink, it is becoming difficult to strike the right balance. The millennial workforce does not blindly follow the diktat of those up the ladder. And they cannot be ignored either as it would make talent acquisition or retention even tougher. 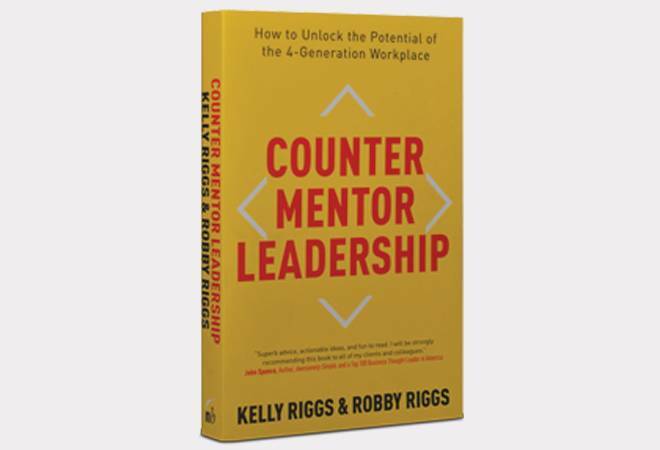 Counter Mentor, the debut book of the father-son duo Kelly Riggs and Robby Riggs, is all about this modern-day leadership dilemma and how it can be fixed, narrated in a captivating and hilarious manner. Kelly and Robby have donned the role of a boomer and a millennial, respectively, and shared practical management lessons through frequent, irreverent but funny banters. However, one cannot forget the serious side of such workplace conflicts and neither do the authors, given that they have decades of experience in coaching managers deal with strategic transformation. The duo has divided the current workforce into two groups, the BOSS (Boomer, Old-School Supervisors) and the KIDS (Know-It-All Digital Self-Promoters) - the former expects undivided loyalty and the latter has a 'why' for every decision taken. What makes the KIDS feel so confident and entitled? In a world driven by fast-evolving technology, KIDS often adapt faster and better than the BOSS. So, the authors stress the need for reverse mentoring, which allows junior employees to guide their seniors. It is a prudent way to bridge any knowledge gap and build a cordial working relationship. On the other hand, the Riggs do not discard the importance of traditional one-to-one meetings although they prefer newer ways of communication via mail and chat. The outcome: The BOSS is advised to invest at least three-four hours a week to meet with direct reports, which will iron out all communication gaps. Some of their recommendations may not sound so unique. Also, the book seems to favour the KIDS more than the BOSS. But then, in a changing world, the BOSS must change more than the KIDS, and the authors have done an excellent job in explaining how to. They have also zeroed in on how to engage with young talent. As Eric Dorne, once a my-way-or-highway kind of BOSS, says, "Millennials need to know that you're invested in them... you must give them meaty, incremental challenges. I don't think you necessarily need to give them constant promotions, but new, intellectual challenges keep them engaged."